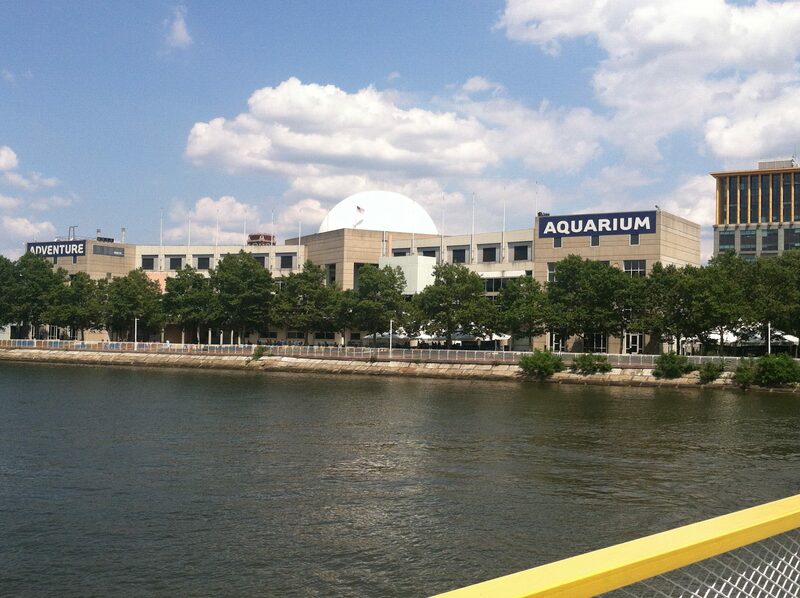 One of the two main attractions on the Camden Waterfront, Adventure Aquarium is among the most family-friendly attractions in the Philadelphia area. It’s one of the most popular among kids, and school groups and camps in the summer often pay a visit to this aquarium. It’s Camden’s most visited attraction, receiving over 600,000 visitors annually. The aquarium is divided into four sections, called zones. Each ones have their own exhibits, which are almost all alliterative. The most popular exhibits can be found in Zone D, including Hippo Haven and Shark Realm. Adventure Aquarium is the only aquarium in the world to have hippos, named Button and Genny. Their enclosure is partially underwater, as hippos do spend their time both in and out of the water. In the underwater portion, you can see fish from African rivers, where the hippos live. Beyond that is an aquarium staple and one of the most popular, Shark Realm. With over 500,000 gallons, this is the second largest tank in the aquarium. Tiger sharks, hammerhead sharks, and stingrays live in this massive tank. There are several points to view the sharks, including the Shark Tunnel. From here, you can be surrounded by the creatures in the tank, and come within inches of sharks. There’s also a the new Shark Bridge, where you can walk that distance over them. Another interesting thing is remains of prehistoric mega-sharks, which once ruled the oceans. General admission is $27 for adults (12+), and $20 for children. All sorts of packages are available for admission, including combos with a 4D movie or a meal. Another package includes the RiverLink Ferry and the aquarium, although there is also the “Fish and Ship” pass, which covers both this and the Battleship New Jersey. The cost varies by season. Near the entrance of the aquarium is a cafeteria, where food is pretty expensive, but it has all the kid-friendly foods, like pizza, hot dogs, fries, all that stuff. Finding seating is a royal pain, though. There’s also a Philly Soft Pretzel Factory. Those are always good. Yes, it’s in Camden. Camden has an extremely negative reputation for crime. However, every city has good parts to it, and the waterfront is Camden’s. Also, the RiverLink Ferry’s drop off point is in front of the aquarium. In all seriousness, don’t go exploring Camden. Just stick to the waterfront.